Hermes Ring Binder Heavy Duty Polypropylene A4 Black 332201 Pack of 1 Sturdy heavy duty long lasting polypropylene ring binder. Attractive metallic coloured spine with write on label for easy identification. Features a standard 2 O ring mechanism. 20mm capacity (200 sheets 80gsm paper). Colour: Black. Hermes Ring Binder Heavy Duty A4 Polypropylene Metallic Silver 332206 Pack of 1 Sturdy heavy duty long lasting polypropylene ring binder. Attractive metallic coloured spine with write on label for easy identification. Features a standard 2 O ring mechanism. 20mm capacity (200 sheets 80gsm paper). Colour: Metallic Silver. 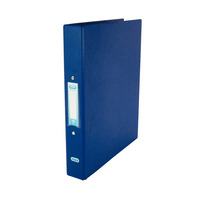 Hermes Ring Binder Heavy Duty A4 Polypropylene Metallic Blue 332207 Pack of 1 Sturdy heavy duty long lasting polypropylene ring binder. Attractive metallic coloured spine with write on label for easy identification. Features a standard 2 O ring mechanism. 20mm capacity (200 sheets 80gsm paper). Colour: Metallic Blue. 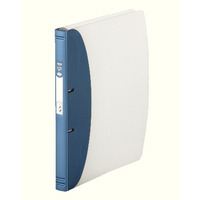 Elba Blue A4 2 Ring Binder 25mm (Pack of 10) 400001508 Pack of 10 Elba A4 2-Ring Binder 25mm. Blue. Premium quality ring binders with a heavyweight plastic covering for increased durability. 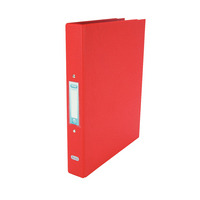 Elba Red A4 2 Ring Binder 25mm (Pack of 10) 400001511 Pack of 10 Elba A4 2-Ring Binder 25mm Red. Premium quality ring binders with a heavyweight plastic covering for increased durability.